Pair of Mid-Century Modern armchairs with sculptural high back design. Newly upholstered in graphic black and platinum Ikat silk fabric with geometric print. 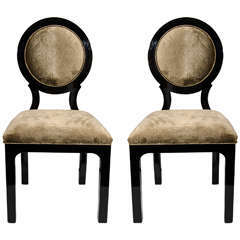 Chairs have tall shield shaped backs with a gorgeous profile. Features button back accents and self-welt details. Pair of Norwegian sculpted lounge chairs. Pair of Paul Tuttle 'Zeta' lounge chairs. Pair of Art Noveau lounge chairs painted in white and reupholstered. 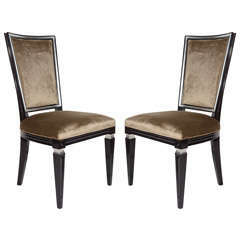 The armchairs are made of mahogany. Pair of Robsjohn-Gibbings for Widdicomb lounge chairs.